Sunday 16th - Oh Boy! Where have the shows gone? Cliff’s act creates crowd hysteria when he appears at the Trocadero, Elephant and Castle, in south east London. Many fans, not content with just seeing him weekly on “Oh Boy!” wanted to see their idol in the flesh too. In order to avoid fans rioting outside the Trocadero, Elephant and Castle after last Sunday's all-star package show, Cliff Richard had to be smuggled out of the theatre through the foyer into a waiting police car. He was taken at high speed through South London to a pre-arranged rendezvous where he transferred to his own car. Between houses, Cliff Richard, Larry Page, Wee Willie Harris and the other artists had to stay in their dressing-rooms due to dense crowds thronging the stage door. On stage during the show, compere teenage d-j Gus Goodwin was showered with coins as the almost full house went wild with excitement. Tension grew to bursting point as the show closed and the predominantly teenage audience left the auditorium. The stage door was completely blocked by a sea of waving arms and chanting girls intent on securing autographs and a glimpse of the singers. Cliff, now with two discs - "Move It" and "High Class Baby" - in the current hit parade, is set for a string of major provincial concert engagements before the end of the year. His complete Sunday date schedule is Walthemstow Granada (Nov. 23). Slough Adelphi (Nov. 30), Colchester Regal (Dec. 7), Worcester Gaumont (Dec. 14), Bristol Colston Hall (Dec. 21), and Hanley Victoria Hall (Dec. 28). Our book "John Barry - The Man With the Midas Touch" is now only available for purchase at a reduced price via this website. Over 300 pages in length, with a foreword by Don Black, the hardcover book includes many unique photos, in both black & white and colour. Order now! 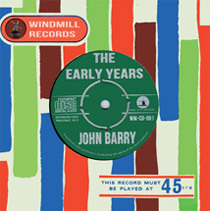 UK customers who order the book before Brexit is complete will receive a free copy of the CD -- John Barry - The Early Years -- the only CD to include all the tracks John recorded for the Chappell Music Library in 1959. Apologies that due to the high cost of postage we can only make this offer to UK residents. The full track listing: 1. Be Mine - Lance Fortune; 2. It's Not Too Late - Johnny Gavotte; 3. The Clanger March - Des Lane; 4. Arrivederci Baby - Little Tony & His Brothers; 5. You Made me Love You - Johnny De Little; 6. Easy Beat - Bert Weedon; 7. Heartbeat - The England Sisters; 8. Youthful Years - Danny William's; 9. I Vibrate - Larry Page & The Saga Satellites; 10. Mood One - The John Barry Orchestra; 11. I want my Bed - Bobby Shafto; 12. Keep A Walkin' - Tony Rocco; 13. Mood Two - The John Barry Orchestra; 14. Action - Lance Fortune; 15. If the Young Ones can be Happy - Billy Cotton; 16. Mood Three - The John Barry Orchestra; 17. Love's a Secret Game - Dennis Lotis; 18. Love Me - Danny Davis; 19. Mood Four - The John Barry Orchestra; 20. The Makings of a Man - Peter Gordeno; 21. Marilyn - Larry Page & The Saga Satellites; 22. Moonbird - Des Lane; 23. Never Ending - Mark Tracey; 24. Nowhere in this World - Derry Hart & The Hartbeats; 25. Opposites - Billy Cotton & Kathie Kay; 26. Smoky Blues - The John Barry Orchestra; 27. Ramona - The Five Dallas Boys; 28. They - Johnny De Little; 29. Trouble Shooter - Bob Miller & The Millermen; 30. You're My Only Girl - Danny Davis; 31. Baby Talk - Bill & Brett Landis; 32. I Got Eyes - Peter Gordeno; 33. The Lolly Theme - The John Barry Orchestra; 34. Santa Claus is coming to Town - Nina & Frederik; 35. Silent Night - Nina & Frederik; 36. White Christmas - Nina & Frederik; Total running time 78' 59"
© 2017 - Oh Boy! Geoff Leonard. All Rights Reserved. ohboy.org.uk re-constructed from original site by Ruud Rozemeijer. Template Design By ThemeLan.